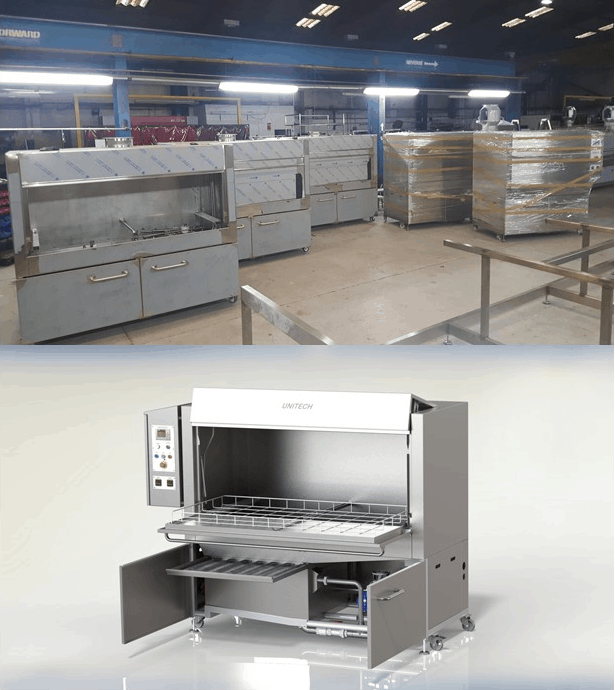 Following the Growth and Success of Unitech Washing Machines, manufacturing has transferred to a separate facility, with full design and manufacturing capabilities, and new fabrication machinery. A new company has been formed as “Unitech Washing Systems Limited” and is looking to continue the growth in its products and services. 2019 has started with a very healthy order book and with a reputation for Quality and Efficiency. The future of Unitech Washing Systems looks set to be secure with new developments and designs in the pipeline. These are exciting times ahead. Unitech Washing Systems have increased production of their Pan Washer range to several units per month. For efficient washing of Multi Head Weigher Buckets, Utensils and Trays, the machines are suitable for high care installations, and incorporate hygienic design principles. The machines can wash a wide range of components, and can be supplied with bespoke product baskets to ensure excellent wash qualities. Please contact us for more details on the full range. Welcome to our new website. Unitech Washers invites you to explore our new website. This links back to our new group marketing strategy, so expect lots more to come. For more information on our group please view the Unitech Group site. Visitors to the site can stay informed with the latest Unitech Washers updates through the news and case study pages. Please supply us with your email address in the relevant forms so we can keep up to date. At Unitech Washers we aim to make your life easier, so whatever your requirements are get in touch.